According to the Centers for Disease Control, about one in six children in the U.S. has a developmental disability, and one in 68 has Autism Spectrum Disorder (ASD). We believe our role and obligation as designers is to improve lives, especially for vulnerable populations. In fall 2017, a Chicago high school became a testing ground for sensory well-being. HKS designers and researchers collaborated with special education experts, academics and scientific advisors to design and build a Sensory Well-being Hub, a place of respite to help students with developmental disabilities recover from sensory stressors and reach equilibrium in school. The pro bono design and research project – a public-private partnership between Chicago Public Schools, the Lane Tech Alumni Association, the ASID Foundation, dozens of consultants and in-kind materials donors and Citizen HKS, our firm’s social impact initiative – outlined an ambitious and empathic goal: improve the lives of people with sensory processing challenges. HKS collaborated with Sean Ahlquist, Assistant Professor of Architecture at the University of Michigan’s Taubman College of Architecture and Urban Planning. Ahlquist created the ongoing research project Social Sensory Architectures on the tensile textile attachment within Cocoon 1.0. This key feature provided tactile interaction and seating for cocoon users. Ahlquist’s multisensory textile environments project was the SXSW Eco Conference’s 2016 Place By Design Speculative + Prototyping winner. The HKS research team, with additional support from an ASID Foundation Transform grant, followed 25 of Lane Tech College Prep High School’s 219 diverse learners who range in age from 14-22, throughout the 2017-18 school year. We studied which sensory interventions the students used most and measured the impact the Hub had on the well-being of students, parents, teachers and staff. The teachers and paraprofessional aides reported they used the Hub for both preventive (through daily scheduled visits) and therapeutic (when students were distressed) purposes. The students visited the Hub to calm down, resulting in their well-being at school trending upward between the two semesters, even though overall well-being scores did not change. The cocoon, as its own micro-environment, was one of the Hub’s most frequently utilized interventions. Both students with and without ASD preferred it. Sensory avoiding students tended to use the cocoon more often, implying that the cocoon provided respite for hyper-sensitive students due to the lower lighting and sound levels. Under stress, students preferred calming elements with a strong tactile component, specifically compression/deep touch qualities, which are present in the textile attachment in the cocoon. With research results in hand, our team went back to the HKS Lab to modify our custom-designed cocoon. Key takeaways indicated that the cocoon’s tent-like structure could become lighter weight, potentially more mobile as well as fully enclosable, thus enhancing its sound insulating and visual separation qualities. The cocoon’s partnering media wall displays interactive nature videos to create a self-contained respite environment. The cocoon microenvironment is tunable: providing occupants agency to adjust aspects of the environment for ambient lighting color and intensity, audio, and projected visual imagery or video. Cocoon 2.0 measures just over 8 feet tall with an 11 foot, four-inch circumference. It’s large enough for a paraprofessional aid or parent, a student and offers wheelchair access. The new version is mounted on a lighter structural frame, approximately half the weight of Cocoon 1.0, with 2×2 lumber available at most local suppliers. An exterior canopy extends over the entrance to minimize the amount of open gap to further reduce sound and light intrusion. 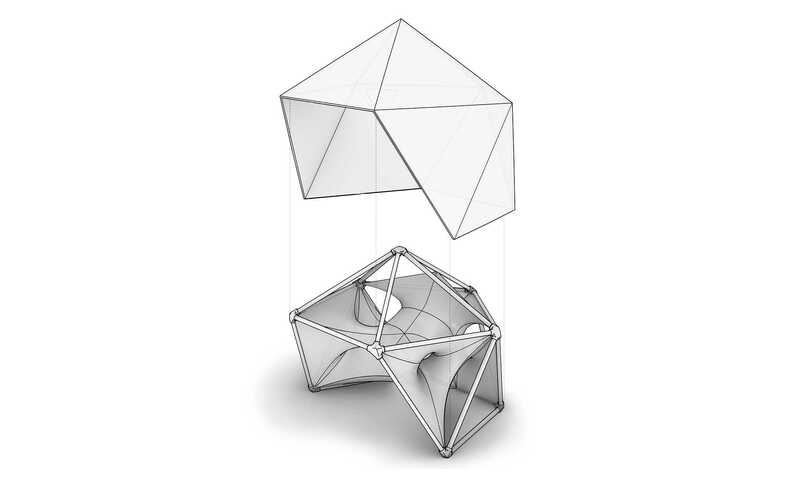 Once again, HKS collaborated with Ahlquist on a tensile textile structure that can insert within Cocoon 2.0. 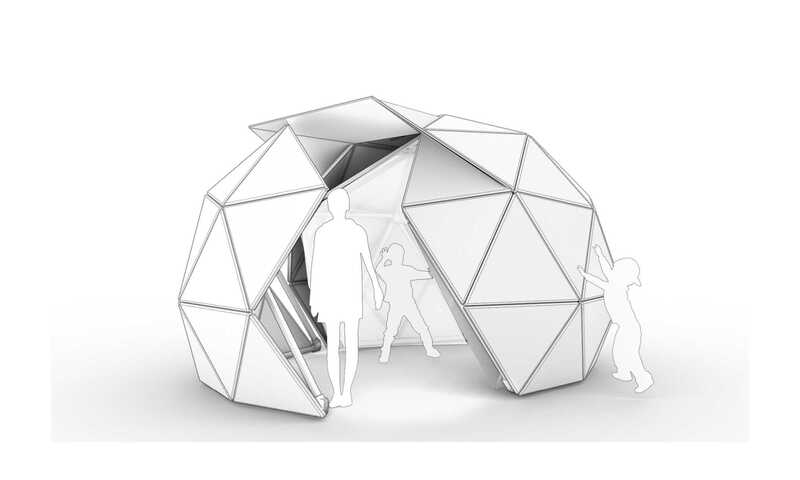 This new, interactive textile structure can occupy Cocoon 2.0 or it can be a free-standing installation – it will be available to experience alongside HKS’ Cocoon 2.0 demo at SXSW EDU’sPlayground March 4-6 in Austin, Texas. SXSW EDU’s Playground is a key conference expo component and interactive space showcasing innovative strategies to stimulate student engagement. Within Cocoon 2.0, SXSW EDU visitors can experience a menu of audio or visual biophilic scenes, user-controlled by a hand-held digital device that’s intuitive to use. 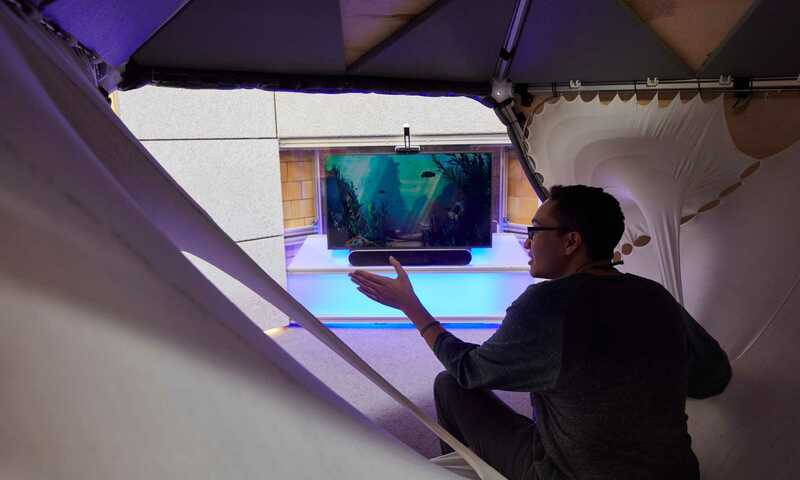 A beach at sunset, mountains above the tree line, or an ocean reef scene are projected within the cocoon, bringing nature to the user – a departure from the touch screen interactivity required of Lane Tech students due to the wall mounted video display screen outside of the cocoon. Our research has enhanced what we learned at Lane Tech: a respite space doesn’t have to be prescribed or predetermined, expensive or proprietary. The Sensory Well-being project aligns with Citizen HKS’ mission to meet the needs of underserved communities. The HKS Cocoon prototype does just that – we’re making our plans available to schools or organizations that wish to create similar respite spaces. Contact research@hksinc.com to learn more.